President Barack Obama threw the switch, bathing the National Christmas Tree in lights and giving an otherwise dreary day in the nation's capital a festive and seasonal spirit. He later singled out Nelson Mandela, the beloved South African anti-apartheid leader who died Thursday, for special gratitude. "He blessed us with tremendous grace and unbelievable courage," Obama said. "We are all privileged to live in a world touched by his goodness." Before lighting the tree, Obama acknowledged the cold and rainy weather and proposed an abbreviated countdown before flipping on the lights. "We're going to start at 5; since it's little wet we shouldn't start at 10," he said. As soon as the tree burst into color, singing diva Aretha Franklin took to the stage for a spirited version of "Joy to the World." 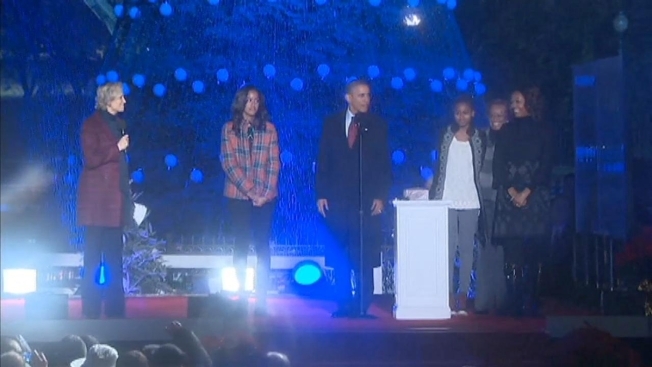 Joining Obama for the 91st annual tree-lighting ceremony were first lady Michelle Obama, daughters Sasha and Malia, and mother-in-law Marian Robinson. First Lady Michelle Obama read "Twas the Night Before Christmas," taking turns with "Sesame Street" Muppet Abby Cadabby. After performances by Franklin, the tenor trio Forte, Janelle Monae, Joshua Bell, Mariah Carey and Prince Royce, Obama joined the performers on stage to show off a few dance steps and close out the program. The festivities kicked off with a 4:30 p.m. preshow. Actress and comedian Jane Lynch hosted the ceremony. Tickets for the 3,000 seats and 14,000 standing-room spots were made available through a lottery earlier this fall. Nat'l Christmas Tree Lighting Ceremony Set for Fri.
Last minute preparations are underway to make sure everything is perfect for Friday's National Christmas Tree lighting. 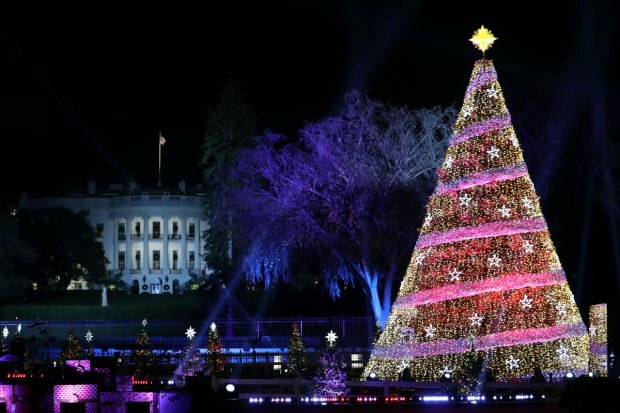 President Barack Obama said in his remarks at last year's ceremony that the tree -- which has been replaced twice after the long-standing National Christmas Tree was felled by high winds in February 2011 -- was a symbol of rebuilding and strength. "In times of war and peace, triumph and tragedy, we've always come together to rejoice in the Christmas miracle," Obama said. "But our tree has been having a hard time recently. ...Just goes to show, nobody's job is safe here in Washington."